Hikari® Gold is a daily diet, developed through years of koi breeding and showing, to meet the nutritional needs of koi while providing excellent color enhancement. 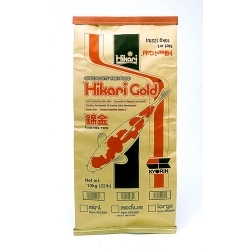 Hikari® Gold will bring out the best in your koi and bring you the success you've dreamed of! Color Enhancement: High in carotene, a natural color enhancer; Brings out natural, brilliant colors; Reduces washed out colors.